Most people know a wood frame is less prone to heat and cold transfer than an aluminum one, since metals conduct temperature much more easily than wood. 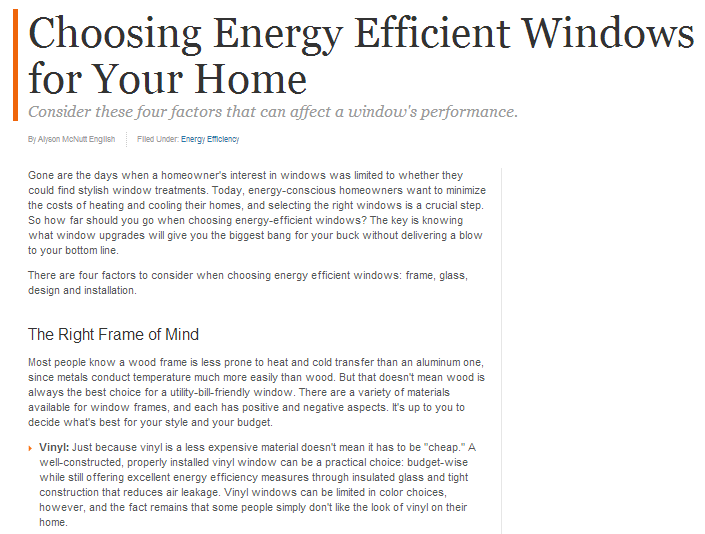 But that doesn’t mean wood is always the best choice for a utility-bill-friendly window. There are a variety of materials available for window frames, and each has positive and negative aspects. It’s up to you to decide what’s best for your style and your budget. Windows don’t just provide ventilation for a structure; they also form a part of its insulation system. They allow breezes during the summer and serve as an excellent insulator during winter. In Michigan, where temperatures are dropping fast due to the winter season, energy-efficient windows are a necessity. Many homeowners have already replaced their existing windows with vinyl-framed ones with the help of reliable window companies in Michigan like Kroll Construction. Aside from vinyl, many other materials like aluminum and wood are also energy-efficient. However, regardless of the type of material your home window frames are made of, the installation should still be done properly to achieve the desired level of energy efficiency. For best results, hire a reputable window company that installs replacement windows in Michigan. Your window replacement company will recommend the best type of replacement window for you. Before winter takes its toll on your home, it may be a good idea to have your old windows replaced; this is also a good way to save your heating system from working exhaustively throughout the cold season. In time, you will realize that having energy-efficient windows has a ton of benefits you can enjoy in the years to come.